Last week, my blog post described preactive leadership. This week, read about someone who practiced preactive leadership… airline pilot Captain Chesley Sullenberger, aka Captain Sully, and what you can learn from him. He was prepared. Preactive leadership is about anticipating what could happen in the future and taking steps to minimize or eliminate the impact. In this case, the result was zero loss of lives in what could have been a major disaster. Fortunately, most people will never have to face a crisis of the magnitude that Captain Sully did but everyone can apply this lesson to the common real-world situations that managers face in the workplace every day. Will you be prepared for the difficult employee conversations you will face? At some point you will have to deal with an employee who can’t or won’t do their job. Have you spent time educating yourself about how to set expectations, how to coach, and how to document so you can help the person succeed? Tough coaching conversations can stress out even the best managers. And avoiding them isn’t an option because of the impact it has on the rest of the team. Make sure you have enough emotional intelligence in your account to stay calm, cool, and collected and have conflict-free coaching conversations. There is always something that you or your teams needs to make work better, faster, easier. Don’t wait around for someone else to recognize the need. You will have to request people, equipment, time, etc. Do you know how to get your boss to say YES? A lot of people assume their boss will say no if they don’t even try. It’s not hard when you learn how. Most leaders I work with agree that communication can be difficult at times. It becomes even more complex when trying to understand and adapt to individual personality styles. Have you invested time in studying your own personality and how it impacts they way you communicate and how you’re perceived? Have you spent any time learning how to read other styles? Building up a balance of self-awareness is a smart investment. When you take a withdrawal, all kinds of conflict can melt away. They you have it. 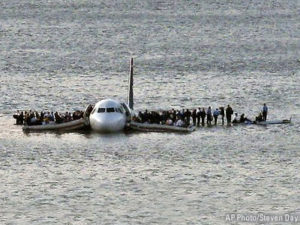 Three ideas for applying Captain Sully’s leadership example. How are you preparing yourself for the future? Do you have a sufficient balance of experience, training, and education in your account? Liz Uram is a speaker and trainer who helps leaders get better results through clear communication.